Being a fan of the film world, Sampath moved from Chennai to Bengaluru in 1970, at the age of 20. BENGALURU:What makes a film a success? Is it the actor, director, musician or public relations? If you think that's it's only these people who a key role in the making of a movie, meet K Sampath, one among the few artists who makes those huge cut-outs of celebrities that attract audiences to theatres. Sampath, the unsung hero who has made stars look even bigger to their fans, hails from Krishnagiri, Tamil Nadu. 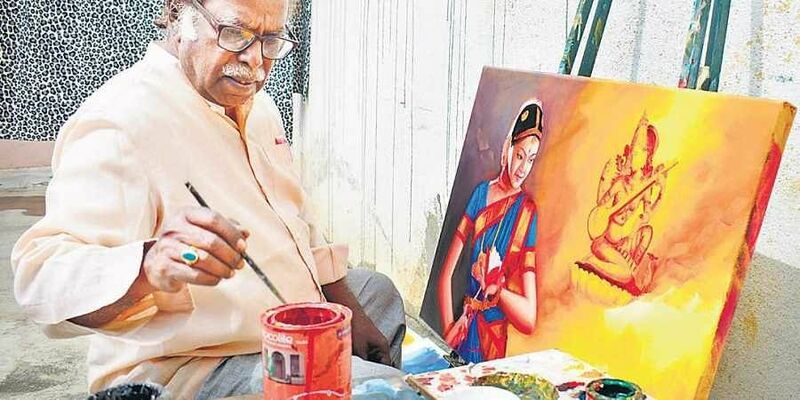 In the late 60s, Sampath joined art school, but due to financial constraint, he had to discontinue and join a signboard shop. He joined as an assistant at an art shop in Gandhinagar. “Initially, I would assist the seniors who would paint posters, cut-outs and banners. They would pay me 30 paise per square foot. Each banner or cut-out would measure 200 sq ft, and we would take four to five days to finish,” Sampath recalled. Sampath was part of the team that made banners and cut-outs of Sandalwood icon Dr Rajkumar for his films such as Mayura and Operation Diamond Rocket. He has also made cut-outs of actors Vishnuvardhan, Ambareesh, NTR, MGR and Chiranjeevi. His cut-outs were more than 70- feet to 100-feet in height. The most recent one he made was for Dhruva Sarja's Barjari, which released last year. “I have worked on Puneeth Rajkumar's Bettada Hoovu, when he was working as a child artiste, to some of his movies in the late 2000s, where the actor worked as a hero,” he said. He used to get three to four projects every week or every fortnight, as movies would release on Fridays. "Painting has no language barrier – we paint with utmost care for Kannada, Tamil or Telugu movies. I have worked on a few Bollywood films too,” he added. His cut-outs were seen across the state in various theatres. "The public finds these cut-outs and banners appealing, and this attracts them to theatres. Some people would come to the theatre just to see these cut-outs – those were crazy days.” Sampath said he would first understand the gist of the story, and then paint based on the characters in the film. Now, with digital media entering the market, single-screens are being replaced by multiplexes. In the multiplex format, there is no space for cut-outs or banners – it is all digitally printed onto flexes. Sampath's only son Jeeva, is walking in his father's footsteps, but is trying to go down a different path. "I make more cut-outs of political leaders now. Flexes cannot be on par with handmade cut-outs, where we artists use attractive colours to make them more appealing,” said Jeeva. The duo runs Jeeva Arts, where they work on the interiors for apartments.